Joy is different things to different people – a taste, a feeling, a memory, a moment. At Sunquick, we believe life should be filled with joy that should be shared – whether you’re at home, on-the-go, together with friends and family – on special and everyday occasions. When it comes to Sunquick, what counts is sharing a refreshing drink with a taste that’s juicy, invigorating and joyful. A drink that’s inspired by nature and available in orange and a wide range of flavours. Sunquick refreshments help you take a breather in today’s modern world. To share togetherness, and to share the moment. Sunquick is all about sharing joyful moments – wherever, whenever, whatever the occasion. After all, joy is the best part of life and Sunquick is a perfect way to share it. For over half a century, the great taste of Sunquick’s distinctive fruity flavour has been delighting people all over the world. That great taste is known far and wide, and we are always working on bringing new flavour sensations to you. Every product we create is crafted until perfected, so you can always be sure of quality products and authentic flavours inspired by nature. Sunquick – the delicious thirst-quenching drink is lovingly made to help create joyful moments for people all over the world. It’s also our goal to provide you with tasty drinks for any occasion – whether you’re on your own, celebrating something special or just getting together with family and friends. Whatever the reason, Sunquick can help you take a well-deserved break and refresh. Since the launch of the Sunquick Concentrate in 1966, we have developed a long tradition of expansion and have established our brand in many new markets. Today we are present in more than 70 countries on five continents, with a portfolio comprising Concentrate, Ready-to-Drink (RTD) and ice lollies. Brothers Jep and Flemming Petersen developed and launched their unique Sunquick Orange Concentrate in the 1960s. The innovative brothers achieved their goal to produce a distinctive juicy drink by concentrating real orange juice. 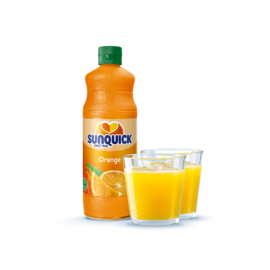 Sunquick looks and tastes like real orange juice and quickly became known as a family drink associated with sharing joyful moments. The Petersen brothers develop Sunquick. Sunquick is launched in the UK to great success. The first Sunquick TV advert airs in the UK.